Danene Fast is the manager for the programs in visual impairments in the Department of Teaching and Learning. 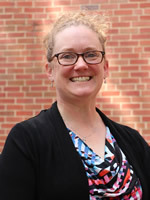 She works with faculty and staff to support these programs, including student support for the Master of Arts, Master of Education, the licensure-only program, and the newest undergraduate program in the department – dual licensure in early childhood education and visual impairments (ECEVI). Within her role she facilitates collaboration between preservice teacher, mentor teachers, supervisors, and other stakeholders; evaluates and provides feedback on preservice teacher progress in the classroom and in coursework; mentors preservice teachers and serves as a resource of education-related knowledge; develops and teaches courses; prepares preservice teachers for licensure/graduation assessments and the job-search process; and participates in curriculum and assessment development that supports preservice teachers' individual growth. I love being a Buckeye and I am incredibly proud of the work we do at The Ohio State University to support future educators. My favorite aspects of this job are direct teaching of university students, collaborating with university personnel to continuously improve programming for future cohorts, and increasing services for students with visual impairments throughout the state of Ohio through these interactions and the implementation of a quality teacher preparation.